Wonderful product, really really cute! The comforter is a good weight. ( A blanket will be needed for winter in colder zones.) the colors are bright and lively and the patterns on the comforter and sheets are adorable. I couldn't be happier!!! Very silky soft and comfortable. Perfect fit for my toddlers twin bed. The sheets are not see-through, and the little white flowers on the sheets accent the comforter quite well! Gorgeous girl bedding and at such a good price!!! I ordered a full for my little girls new big girl bed. It is so beautiful, bright and clean looking. Enough weight to the blanket and the sheets are silky and light. Not super high quality but still nice. 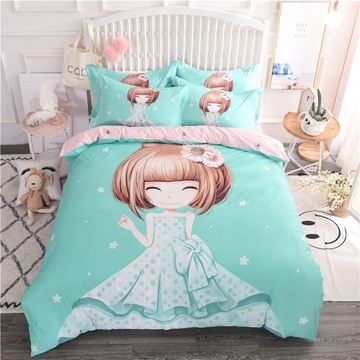 This bedding is not only adorable, but it is soft and comfortable as well. It's so affordable and matches my daughters room perfectly. I love the silky-soft feel of the sheets and comforter and it is nice and cool while you sleep. I'd def recommend to anyone! This set is so cute! I am ANNOYINGLY particular about bedding. I know everyone worries about the softness. It's super-soft. Like only my 20 year old Ralph Lauren sheets could compare to this and that is saying something! I've washed them a couple of times. There are no little balls building up or anything.